Entrepreneurship is all about leap of faith. Every small business owner does it. The dirty secret is that these leaps of faith are not one-time occurrences. Small business owners have to do it again, and again. While serial entrepreneurs almost ways jump into the new almost as if it’s as easy as it is to breathe, many other business owners have to grapple with the new, surmount new challenges everyday, run their business, embrace new ways to market products/services, and more. Yet, doing all of that is “mediocre” for entrepreneurs. Assuming you want more out of your entrepreneurial efforts, there’s so much more to do. There’s fun in being small. You can be agile, quick, and highly receptive to change. You could make decisions in a second. Most people mistake “small” to being “no good.” Small is certainly beautiful. However, no one ever said that you don’t have to leverage to be small. You could be a tiny one-person operation and still have as much leverage as you like. 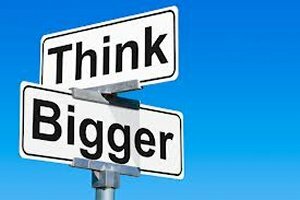 The “small” and “big” is in the mindset, and that has nothing to do with profitability. Find ways to leverage your business using people or technology or both. For instance, hire help to manage and organize your operations. Have ambitious sales people connect with partner channels to drive up your sales. Hire help for any aspect of business that you are not good at where you’d inadvertently spent tons of time, such as accounting, legalese, shipping and logistics. Whatever you do, grow organically. Make it all a part of your business plan from the start. Create your business plan outline in such a way that it accommodates for growth and accounts for cash flow. Your business plan shouldn’t be a professional piece of writing only to be forgotten. Much like musicians use their music notes, you have to use your plans and blueprints to orchestrate the growth of your business. You aren’t in a race, you are in business. Take your time to grow and scale. Do it with your money and not from external funding. Good start there, but that isn’t enough. No matter which business you are in, it’s time for to go ecommerce. It’s a 300+ billion dollar opportunity in the U.S alone. Add the world’s markets to this number and you’d only wince at the size and opportunity. It’s easy to setup ecommerce stores today thanks to technology and the low-barriers to entry. Given that you are already in business (whether you sell products or services), it’s only a matter of adding the internet and the mobile as much-needed channels for your business growth. The decision to go digital to sell doesn’t even have to be strategic for you to let it marinate in your head or discuss with partners (if any). It’s a “Do it now or good luck Chuck” situation. Why are You Local while Global Awaits? Unless you are an entrepreneur who is extremely happy with a local business and has no intentions of growing the businesses larger than it is, every other business owner gets into the: will grow, profit more, and create more wealth category. If so, why stay local? There’s only so much market opportunity as long as you stay local. You’d also have stiff local competition that eats into the already diminutive size of the market available to you. Kunal Sarda, co-founder and COO of VerbalizeIt, wrote on Forbes.com that 96% of the world’s consumers live outside the U.S. Go multi-lingual, multi-national, and deal with multiple currencies. The rules are changing. Your country isn’t the only country in the world where people need your products and services. Instead, you could reach to nearby cities or spread your wings to the whole country. If you could work a way to stretch beyond borders and go global, your market size grows that much bigger. Taking the ecommerce route is an obvious first choice but imagine the size of the target market you’d have if you plan to go global! Small businesses think small with most aspects of their business. It’s no wonder that E-myth Revisited by Michael E. Gerber was such a popular book. Since marketing fuels capitalism and helps you grow your business, you need to grow up in thought, form, and function when it comes to marketing. It’s time to walk the rope and feel the flinch, as Julien Smith writes about in his book The Flinch. If you never advertised online through Google AdWords, do it now. Increase your exposure with social media ads or sponsored updates. Did you ever try hiring global talent for creative or marketing services? Try outsourcing. Experiment with landing pages, native advertising, media buying, leveraging ad networks, and retargeting. Kristy L. Campbell, director of marketing and Communications at Manta, also has a few tips to mobilize your marketing: dare to go back to traditional media, make sure you stay on the grid, create mobile opt-in programs, and tap into social media. Stay small but think big. Growing into the “big” happens not by chance but by thought, execution, and commitment. Mistakes are a part of the package. Assuming you want success and growth, thinking is your ticket to the destination you have in your mind. Should I Become an Affiliate or Buy into an Ecommerce Mall? Rohan is a serial blogger and digital strategy consultant at E2M Solutions. He also helps startups develop remarkable user experiences at Only Design. You should follow him @searchrook on Twitter. I may be a tad late on the New Years bandwagon, but I still appreciate the post! Great tips and a Happy New Year Rohan! Hey, New Year’s when You decide you’re going to change the times! 🙂 Thanks, Ryan. Nice tips for Entrepreneurs Rosalind every business should have a huge Internet presence nowadays that is where all the money is made. Why just limit yourself to your local area when the World is at your fingertips with the Internet. Nice tips again and Happy New Year.